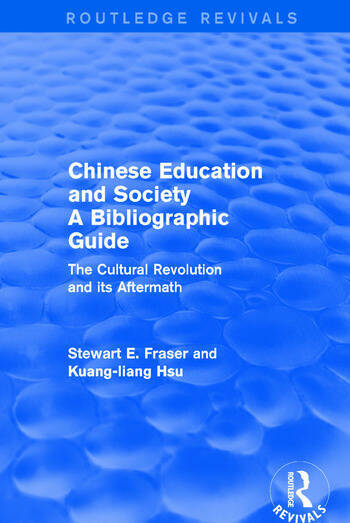 This title was first published in 1972: This bibliography is the most comprehensive and up-to-date reference work available on developments in Chinese education since 1966. In addition to primary materials from the people's Republic of China, the entries are drawn from other Asian sources, as well as from American and European studies. All levels and major fields of education are covered, and the pervasive impact of idealogy and politics on education is carefully documented. Most entries are fully annotated , and many are cross listed. Professors Fraser and Hsu have prepared a lengthy introduction which provides valuable information on the research centers, journals and publishing/translating agencies active in the field.